Posted on 19, May 2016 by EuropaWire PR Editors | This entry was posted in Automotive, Awards, Germany, Transportation & Logistics and tagged 2016 Latin American Bus and Coach Chassis Price/Performance Value Leadership award, Daimler Buses, Frost & Sullivan’s, Ricardo José Da Silva. Bookmark the permalink. Stuttgart / São Paulo, 19-May-2016 — /EuropaWire/ — Daimler Buses is proud recipient of Frost & Sullivan’s “2016 Latin American Bus and Coach Chassis Price/Performance Value Leadership” award. The presentation of one of the most coveted awards conferred on the worldwide bus industry took place on 12 May 2016 in the Brazilian city of São Paulo. 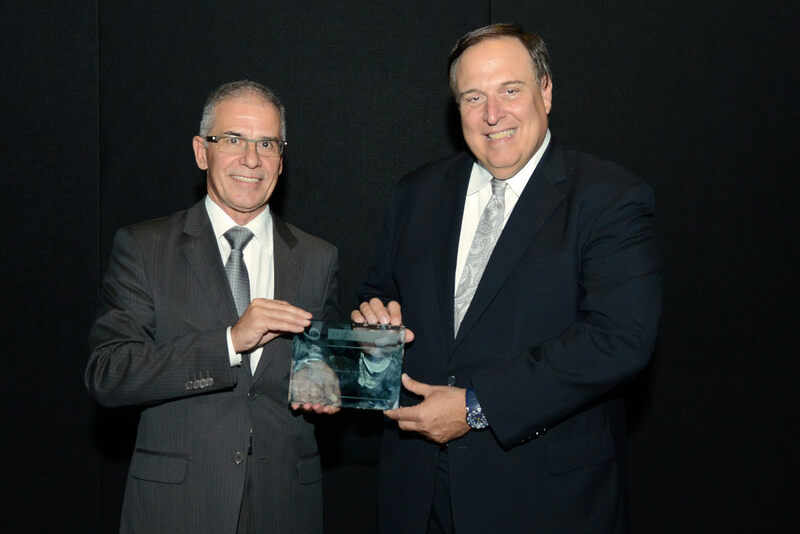 Ricardo José Da Silva, Head of Daimler Buses Latin America, received the award from the hands of David Frigstad, Chairman of Frost & Sullivan, during the official ceremony. The international business consultancy Frost & Sullivan presents the awards in recognition of companies, corporate divisions, business units, and organisations that achieve the “best-practice” performance in their respective industries. The assessment is based on factors such as performance orientation, problem-solving expertise, customer and service orientation, commitment, and the implementation of innovative, long-term, and sustainable strategies that highlight the major contributions made by the award recipient to progress and growth in the global market and competitive environment. Frost & Sullivan’s global team of analysts used a complex evaluation process and in-house research methodology to select the recipient of the “2016 Latin American Bus and Coach Chassis Price/Performance Value Leadership” award. The ten evaluation criteria included a critical assessment of price/performance attributes such as technological leadership, functionality, product and service quality, and performance reliability. Next, the added product value established through evaluations amongst customers, suppliers, and bodybuilder partners; the experiences of bus operators during vehicle procurement and the analysis of operating costs; the available maintenance packages and services; plus the brand value were considered. Daimler Buses Latin America emerged as the clear winner on at least six counts of the evaluation. Latin America is purely a chassis market, with buses completed fully by local, specialised bodybuilders. Daimler Buses Latin America has been producing buses in Argentina and Brazil for over 60 years. Despite a difficult market situation, the company has been able to further consolidate its leading position in the Latin American market with respect to brand image, unit sales, overall profitability, safety, and environmental compatibility—resulting in 70 percent market share in Argentina and 53 percent in Brazil. One example is the expansion of the sustainable Bus Rapid Transit (BRT) mobility concept in Latin American cities: Rio de Janeiro and Bogotá are among the 35 cities worldwide that have opted for intelligent BRT systems from Daimler AG. This global success stems from the company’s extensive portfolio of low-maintenance buses and bus chassis, many years of experience in urban planning, accumulated service know-how, dense bus-specific service network, and tailor-made service contracts—all of which contribute to making this global leader in market share, innovation, and technology the benchmark of the Latin American market. The analysts at Frost & Sullivan particularly praised the dependability, reliability, and optimum overall cost-effectiveness of Daimler Buses Latin America’s products and services, which are strictly tailored to the needs of individual customers and bodybuilder partners.